Think you know the proper swimming warm-up? Yes, many swimmers and coaches feel like they know how and why a swimmer warm-up is performance. Despite warm-up being a regular, continual practice, the research shows different information than what many in the swimming community believe. How much of swimming warm-up is physiological compared to psychological or even neural? The positive effects of warm-up seems more consistent nowadays and the performance seems to be improved more than 1% in distances equal or above 100 m. These effects were for long time attributed essential to physiological responses. The warm-up is known to increase muscle and body temperature and this is considered the major contributing factor to influence performance. The exercitation during warm-up (active warm-up) might stimulate some physiological aspects (for example, increasing the oxygen uptake and regulating the acid-base balance of the body) that can also influence performance. This places the physiological aspects of warm-up on high-relevance for maximizing the subsequent performance. Recently some findings draw our attention to the importance of warm-up on the psychological preparedness of the swimmer and on the neural aspects. Warm-up could have an important role in sensorimotor adaptation to the movement, with the swimming motor skills patterns being reproduced in a similar way in the race. We suggested that this could be caused by mechanisms derived from acute motor learning processes and from the mental preparation during the specific warm-up. The swimmers seems to adapt according to the biomechanical pattern used during warm-up and replicate it during the initial meters of the race. However, this is only a suggestion and more research is needed to confirm so. We are not able, yet, to quantify the relative importance of each aspect of warm-up responses, but besides the clear importance of the physiological adaptations, there are neural and psychological responses that should be considered. What do we know about different swimming warm-up volumes for sprint swimming performance? The effectiveness of priming exercises on performances is influenced essentially by warm-up intensity, duration and the recovery time between the warm-up and the race. Until recently, most studies suggested a volume between 1000 and 1500 m to benefit swimming performance and the technical efficiency of the swimmer. When comparing the effect of different volumes, a standard (1200 m), a shorter (600 m) and a longer one (1800 m), the standard volume led to better performances and the longer one resulted in lower 100 m freestyle performances. Additionally it is important to refer that the three warm-ups caused different physiological adaptations, and the higher heart rate and testosterone/cortisol ratio levels after trial seemed to allow a faster initial recovery in standard condition (1200 m). Therefore, we suggested that this warm-up elicits higher efficiency during the race and optimizes recovery. Our results were in line with the existing literature in other sports that found excessive volumes of warm-up to be detrimental to performance. Do you feel like longer warm-ups are detrimental to sprint swimming? According to our results, high-level swimmers should benefit from a warm-up up to 1200 m. Higher volumes or excessive warm-up volumes could impair sprint performance (100 m freestyle). In fact, the shorter warm-up of our study led to better 100 m times than the longer one, demonstrating the potential of this warm-up also. More research is needed on the potential of the short warm-up, perhaps including some tasks focused on post-activation potentiation. Our results and the literature seems to agree that a volume around 1200m is enough to cause the metabolic responses to maximize sprint races, and the excess of volume during warm-up only constitutes a risk for the swimmer and potentially impair the performance. Your recent study noticed differences in swimming characteristics with a race-pace compared to a traditional warm-up, how can coaches/swimmers use this information? Some research has reported that warm-up may optimize performance by enhancing oxygen uptake kinetics and consequently reducing the anaerobic glycolytic contribution in the beginning of the race and perhaps delaying fatigue. Therefore, our purpose was to use this information and to compare a race-pace set (control warm-up; 4 x [25 race-pace and 25 easy pace]), a common practice before a 100 m swimming race, with a submaximal set (8x50m at 98–102% of critical velocity) that stimulates an increased oxygen uptake (experimental warm-up). Knowing that the aerobic metabolism is relevant for the 100 m freestyle (about 40% of contribution), it should be interesting to find if a pre-trial increased of oxygen uptake elicits some performance changes. Despite there were no differences in the 100 m freestyle performance, the physiological and biomechanical responses during trials were different. This means that experimental warm-up could cause an internal adaptation and this could be used to optimize the race strategies according to each athlete’s needs. Experimental or control warm-up sets should be applied depending on the race strategy that better fits with each particular situation. Perhaps, the aerobic stimulation set should be implemented when a longer waiting period would occur, taking advantage of the higher core temperature observed. It was also interesting to find an acute learning process to each specific set that could justify some different biomechanical patterns during trials. So, if the race depends more on the higher stroke frequency in the first meters, then a race-pace set should be applied. Summarizing, the use of an aerobic stimulation set is a viable alternative to the traditional race-pace set before sprint races. In addition, it stimulates the core temperature and should be used when there is a long time-gap between warm-up and the race. On the other side, the race-pace set stimulates the use of higher stroke frequency in the beginning of the race and should be used if it is our intention. 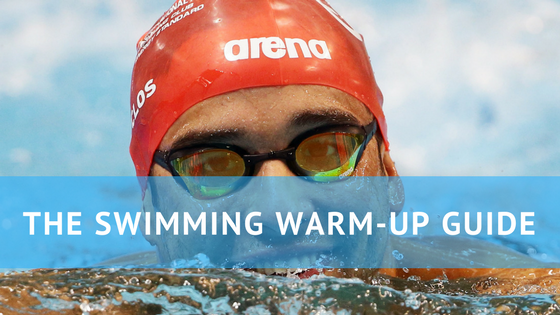 How should a warm-up differ for longer events? The longer swimming races have a larger influence of the aerobic metabolism. The literature is scarce on longer swimming races, but we suggest that swimmers concentrate their warm-up on technical issues (for example, swimming efficiency, large distance per stroke) and on progressive stimulation of the oxygen uptake, so that they could increase body temperature and stimulate the mitochondrial processes. The stimulation of oxygen uptake may remove some of the inertia in mitochondrial activity and the aerobic system improve its preparedness state, allowing oxygen to be used at faster rate in the beginning. However, this is only based on the results obtained until now and further research is needed with regard to different swimming distances and techniques. How can a swimmer and coach determine the best swimming warm-up protocol for their event distance and swimming characteristics? This was perhaps the main question that motivated our work since the beginning and we believe that in a few years it would be possible to adjust individually the warm-up with high-accuracy, helping swimmers and coaches to maximize the performance. For now, we know that there is an individual response to warm-up and there is an important role to be done by the coach, since early stages of preparation, on discover the proper structure of warm-up to each swimmer, based on scientific evidences. What we suggest is that the swimmers should consider to warm-up for a moderate or short distance (≤ 1200 m), choosing race-pace or aerobic stimulation according to race strategy and/or time-gap between warm-up and the race, trying to complete it as close as possible to the race. The findings also showed that the swimmers adapted their biomechanical stroke patterns according to each warm-up, denoting the importance of performing swimming drills for higher individual efficiency. The beneficial effects of in-water warm-up decreases over time, and if another pool is available, the swimmers should re-warm-up close to the race. According to our findings, we suggest that the first warm-up should be focused on aerobic stimulation, and the second one (immediately before the race) should be shorter and with race-pace stimulation, avoiding fatigue and adjusting the biomechanical patter to use in the race. When it is not available a second swimming pool, coach and swimmer should understand that, besides some mental preparation, the swimmers should try to increase a little the heart race, oxygen uptake and temperature (core temperature) and maintain elevated as long as possible. Specific tasks to potentiate the warm-up routines should be found, maybe by optimizing the waiting time before the swimming race. Passive warm-up activities are being studied as a way for maintaining a warmed condition to help the swimmers to improve performance, and other dry-land tasks (perhaps stimulating the post-activation potentiation) should be considered. These warm-up components are far from being well known, but the first step has been taken and should be continued. Neiva, H.P., Marques, M.C., Barbosa, T.M., Izquierdo, M., Viana, J.L., Teixeira, A.M., & Marinho, D.A. (2016). Warm-up for sprint swimming: race-pace or aerobic stimulation? A randomized study. Journal of Strength and Conditioning Research (in press). Advance online publication. doi: 10.1519/JSC.0000000000001701. Neiva, H.P., Marques, M.C., Barbosa, T.M., Viana, J.L., & Marinho, D.A. (2016). Effects of 10 min vs. 20 min passive rest after warm-up on 100m freestyle time-trial performance: a randomized crossover study. Journal of Science and Medicine in Sport. Advance online publication. doi:10.1016/j.jsams.2016.04.012. Neiva, H.P., Marques, M.C., Barbosa, T.M., Izquierdo, M., Viana, J.L., Teixeira, A,M., & Marinho, D.A. (2015). Warm-up volume affects the 100m swimming performance: a randomized crossover study. Journal of Strength and Conditioning Research, 29(11), 3026-3036. Neiva, H.P., Marques, M.C., Barbosa, T.M., Izquierdo, & Marinho, D.A. (2014). Warm-up and Performance in Competitive Swimming. Sports Medicine, 44(3): 319-30. doi: 10.1007/s40279-013-0117-y.